Although it looks like three color inks, I actually used six different ink pads for this card. The white lines are actually the same splatter stamp as I used for background in the "Time for a man's card". 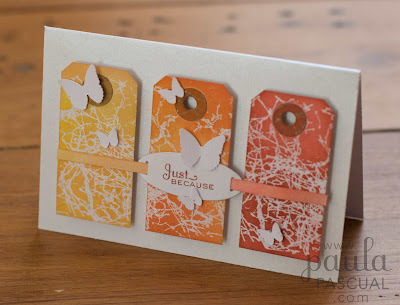 The difference is that I stamp with VersaMark and then embossed with clear embossing powder over a white tag, then once embossed I applied the inks, making the contrast bigger. The butterfly is from a Martha Stewart punch. Yes, I was wondering the same thing. This is a lovely piece of work, the colour combination works so well, extremely pretty. I love this cars - the colours are fab & the tag background is amazing. I'm looking forward to seeing you on Sat. lovely card..nice to see tags used in a different way...fab! Hi Paula another lovely creation. I also love the baby card on post below too. I would also love to get your double sayings, but I don't think they are in stock with any of the websites you list at the moment - unless you know different???! Mind you I haven't done a "full" internet search yet actually......!